The British property market has defied worries over Brexit with house prices surging by their highest ever monthly rate in February, according to the latest data. More than reversing a nearly 3 per cent fall in January, the latest Halifax house price index found that prices spiked a record high 5.9 per cent last month. Halifax’s index also shows that prices in the three months to February were 2.8 per cent higher than the same three months a year earlier, and that prices were 1.8 per cent higher than the preceding three months of September to November. The figure questions the narrative that has emerged over the last year of Brexit strangling the property market, as both buyers and sellers delay decisions. However, experts warned that the price could just be a symptom of the shortage of homes on the market. Russell Galley, Halifax’s managing director, said: ‘The shortage of houses for sale will certainly be playing a role in supporting prices. 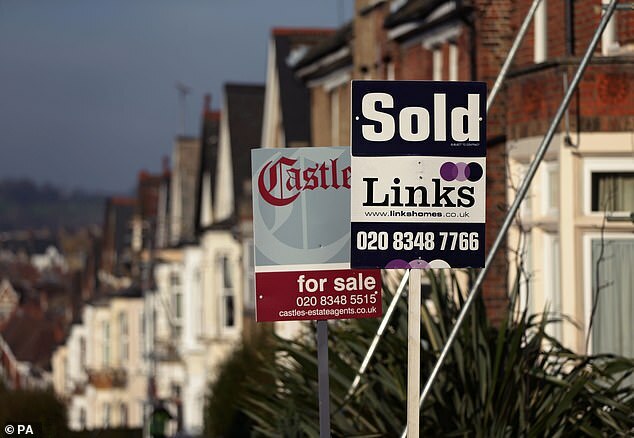 The lender had previously said that house prices had seen ‘next to no movement’ in response to last month’s figures that found prices in January grew by just 0.8 per cent year-on-year. According to the Halifax index, the average house price now sits at £236,800, marking the third time in the last seven months that prices had risen. Halifax’s managing director had previously predicted potential growth of up to 4 per cent in 2019 after a better than expected December which saw prices rise by 2.5 per cent. Rival lender Nationwide found in its own index at the end of January that prices inched up just 0.1 per cent in the year to January 2019. Different data from HMRC also showed January was the fifth consecutive month of more than 100,000 home sales, with 101,170 being sold. One mortgage broker echoed Galley’s words on the shortage of homes being primarily responsible. Andrew Montlake, director of Coreco, said: ‘What the February data underlines is that the lack of homes on the market, and broader supply deficit, have the potential to mitigate the impact of Brexit on house prices. ‘There’s all manner of political uncertainty at present but when it comes to house prices, the lack of supply could prove the property market’s trump card. Sellers should not see this as a pretext to raise their prices, however. One month does not a market make. Pete Mugleston, managing director of Online Mortgage Advisor, said: ‘The annual, quarterly and monthly growth of house prices announced by Halifax this morning, is likely a result of the increasing numbers of first time buyers on the market. ‘In fact, we’ve seen a 54.6 per cent uplift in mortgage enquiries, in line with the yesterday’s UK Finance data that also showed new homeowners are at an all-time high. Jonathan Hopper, managing director of Garrington Property Finders, said: ‘It’s too early to tell if this is a bounce or a blip. But such a dramatic resurgence in house prices should galvanise a property market that talked itself into stagnation in January. ‘The huge swing in the monthly rate of price change tells us only two things – how volatile this measure is and how weak January’s reading was. February’s rapid correction, welcome though it is, shouldn’t be seen as an omen of things to come. ‘Better clues lie in the monthly and quarterly growth rates, which have returned to type – steady and sustainable rather than stellar.